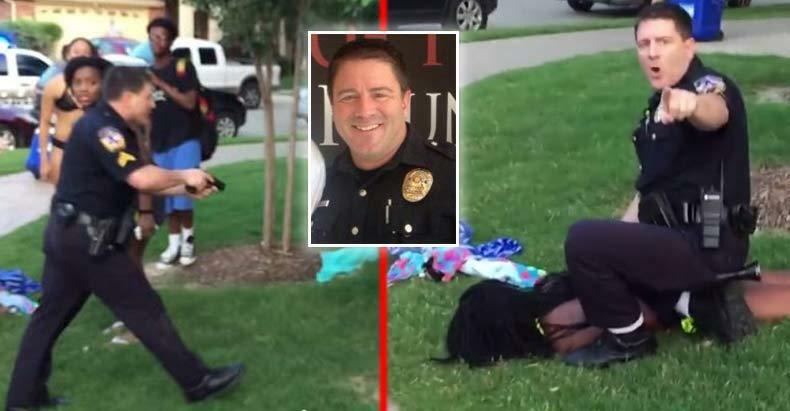 McKinney, Texas – In a testament to the current state of policing in the U.S., the same officer seen in the viral video manhandling a 15-year-old girl and then pulling a gun on unarmed teens at a pool party, was ironically named Officer of the Year in 2008, according to a LinkedIn profile in his name which has since been removed. Officer Eric Casebolt was suspended after a video showing the officer manhandling a teenage girl and pulling his gun on unarmed teens surfaced on social media and went viral. The fact that this officer was given an award for being the best officer in 2008 speaks to the extreme crisis currently facing policing. There were multiple civil rights violations that occurred in the seven minute film. The officer threatened to stomp people if they didn’t stop running their mouths. The officer assaulted and detained someone who didn’t obey an unlawful order. The officer pulled his firearm on unarmed teens like the cowardly punk that he is. Some people may think that this is too much to say, but it happened. You can watch it. This officer’s actions, captured on video, if even slightly indicative of how he operates on a regular basis, seriously call into question the legitimacy of any type of recognition and honors he has received for his past actions as a police officer. “I am disturbed and concerned by the incident and actions depicted in the video,” McKinney mayor Brian Loughmiller says in a statement on Sunday. How could a man that acted in the thuggish manner that Casebolt did in this video, be not only considered for, but have won an Officer of the Year Award?